William H Bonney, "Billy the Kid"
Map of New Mexico showing principal towns during territorial era. 1850. Designated as a territory and denied statehood. New Mexico at that time included the present-day state of Arizona, southern Colorado, southern Utah and southern Nevada. 1851. Bishop Jean Baptiste Lamy arrives in New Mexico. Established schools, hospitals and orphanages throughout the territory. 1854. The Gadsden Purchase from Mexico. Adds 45,000 square miles to the territory. 1861. The Confederate Army invades New Mexico from Texas. The Confederate Territory of Arizona is declared with capital at La Mesilla southern New Mexico. Territory of New Mexico loses northern most section to the creation of the Territory of Colorado. 1862. Confederate occupation ends in New Mexico. Battles of Velarde and Glorieta Pass. 1863. Territory of New Mexico is divided. Territory of Arizona is created. 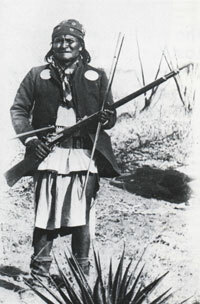 Navajos and Apaches are relocated to Bosque Redondo in the plains of eastern New Mexico. 1868. Navajos and Apaches are allowed to return to their homelands after thousands died from disease and starvation. Opens trade and migration from the East and Midwest. 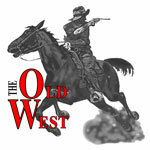 Lincoln County Wars erupt in southeastern New Mexico. 1881. William H. Bonney, "Billy the Kid". Shot by Sheriff Pat Garrett near Fort Sumner, NM. Indian hostilities end in Southwest. 1898. Thomas A. Edison films first movie. Moved to Coffeyville, KS in 1862 with his parents and then to Colorado after the death of his father William H. Bonney, Sr. His mother remarried William Antrim who moved the family to Silver City, NM. No public education. Moved about the West while a teenager through TX, AZ, NM and Mexico. Reportedly shot and killed 21 men by his 21st birthday. Three Apache braves on the Chiracahua Reservation in AZ. A African-American blacksmith at a card game in Camp Bowie, three card dealers in Mexico, two Apache Indians in the Guadalupe Mountains, cowboys Billy Morton, Frank Baker and Andrew L. "Buckshot" Roberts in 1876, while Billy was working in Lincoln County during the cattle war; Sheriff William Brady and Deputy George Hindman, 04/01/1878; Cattleman Robert W. Beckwith 07/17/1878; Gunmen Joe Grant and Jimmy Carlyle in 1879; Indian agent Joseph Bernstein; Deputies and wardens J.W. Bell and Robert W. Ollinger as he escaped from the Mesilla, NM jail 04/28/1881. Shot and killed by Sheriff Pat Garrett 07/14/1881 on the Maxwell Ranch near Fort Sumner, NM. A little more than four months before his 22nd birthday.